Thank you for visiting our registry! Kevin and I have been blessed with many hand-me-downs and secondhand finds, so we don’t need a lot of ‘stuff’ to prepare for baby. 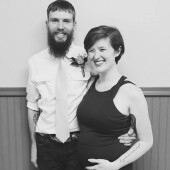 We would appreciate cash and/or gift cards to help out with expenses during my maternity leave. Of course, diapers of all brands and sizes are welcome as well. We hope to celebrate with you on September 2nd!